The Ringling Brothers Circus will be coming to town again in a few months. This year I’m going to join in with the group that will be protesting the circus. Aren’t people aware of all the abuse that the animals must endure as they are being “trained” to perform? Hasn’t this been in the news over and over again? I just find it hard to believe that so many people still frequent the circus! Actor Alec Baldwin is a crusader for the elephants. He did a PETA public service announcement to educate people on what happens with the elephants in the Ringling Brothers and other circuses. 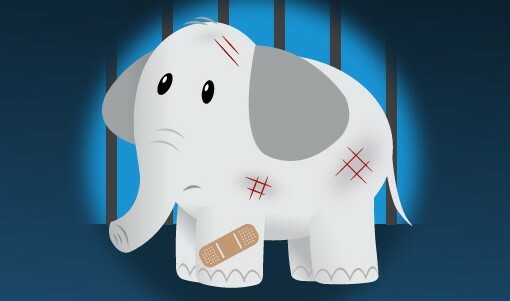 As you can see in the video, he tells how they go through years of abuse, starting when they are babies: They go through years of torture and abuse, starting with babies being ripped away from their mothers and “forced to begin training for circus performances…they are stretched out, slammed to the ground, gouged with bull hooks and shocked with electric prods. They scream, cry and struggle while they are forced into the painful positions necessary for circus tricks.” When elephants are not performing, they are chained in cramped box cars or arena basements. In addition to being highly intelligent, elephants are very sensitive animals. They form deep family bonds and live in tight matriarchal family groups. The oldest and largest female is often the lead matriarch. Female elephants spend their entire lives with their mothers. Males typically spend twelve to fifteen years with the herd before leaving the family unit. The deep bonds they form also mean that they mourn loss. They mourn the deaths of other herd members and it is especially heartbreaking when babies are torn from their mothers to be recruited into a life of circus abuse. There have even been eyewitness accounts of elephants shedding tears. 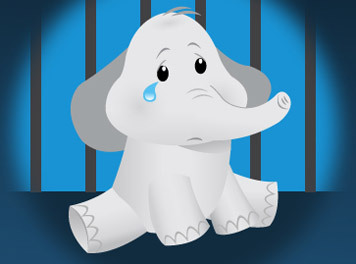 Please help support the rights of elephants: DON’T EVER ATTEND CIRCUSES THAT USE ANIMALS! Let’s honor these magnificent creatures and let them live the lives God intended them to live: free and happy. For more information on circus elephants, check out the Ringling Beats Animals website. Back in 2011, Feld Entertainment, the parent company of Ringling Bros. and Barnum & Bailey Circus, must now pay the largest settlement hereof its kind in U.S. history―$270,000―for violations of the Animal Welfare Act (AWA) dating back to 2007. HAVE A HEART: DON’T ATTEND CIRCUSES THAT USE ANIMALS AND HELP SPREAD THE WORD SO THAT THESE MAGNIFICENT ANIMALS CAN BE SPARED A LIFE OF TORTURE, PAIN AND ABUSE.